Not to be confused with Shikhara. For other uses, see Shikara (disambiguation). 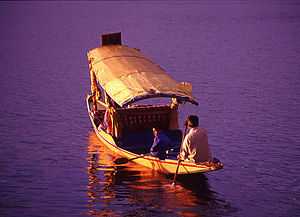 The shikara is a type of wooden boat found on Dal Lake and other water bodies of Srinagar in Jammu and Kashmir, India. Shikaras are of varied sizes and are used for multiple purposes, including transportation of people. A usual shikara seats half-a-dozen people, with the driver paddling at the rear. Like the Venetian gondolas, they are a cultural symbol of Kashmir. Some shikaras are still used for fishing, harvesting aquatic vegetation (usually for fodder), and transport, while most are covered with tarpaulins and are used by tourists. Some are used as floating homes by poor people. The craft relies on deodar wood (which does not decompose in water) ranges from 25 to 41 feet in length. The pointed front end is followed by a central section made of 8 planks of wood and the boat eventually ends in a flat rear segment. Two planks of wood lend to each of the side elevations a vertical height of 1.5 feet. It has a conspicuous spade shaped base. The nails and iron clamps used for joinery are flush and fixed into the wood diagonally when they are red hot, to ensure stronger bonding. Care is taken to keep them hidden for the visual aesthetics of the boat. Caulking uses a paste containing poplar seed. The boat is created over 10 to 12 days. Seating arrangements are organized in the central segment of the boat by positioning cushions and related upholstery over the built-in storage space underneath. A canopy is supported on four pillars. The centre and the ends are equipped with iron anchor rings and wooden pegs, which are used to fasten the shikara on the banks of the lake. The shikaras are eventually painted in bright colors and may further be polished, engraved and embellished. The boats are often navigated by two boat men in phiran and they carry kangris (portable heaters) and have cushioned seats and back rests. The long boats crowd the Srinagar lakes. 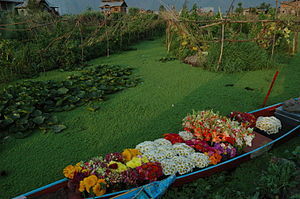 They are used for getting back and forth from the houseboats or for longer tours of Dal Lake. Because the Dal is central to the landscape of Srinagar, many places of tourist interest have been built in its vicinity. Nishat and Shalimar gardens as well as the Hazratbal shrine are directly accessible by shikara. White-throated kingfishers, large birds with robust bills can be seen perched on the branches of willow trees. These birds concentrate their hunting on the floating Gardens. These man-made islands of reeds, willow rods and aquatic vegetation are held together with humus from the lake bottom providing a rich source of food in the form of frogs, lizards, mice, grasshoppers and other insects for wildlife. ^ Kevin Sites (2006). "Boat People, Unable to afford homes on land, the poorest of Kashmir's poor live on open fishing boats, where life is always unsteady". Yahoo! News. Archived from the original on 20 July 2006. Retrieved 6 June 2006. ^ a b c d e "Shikaras: The Floating versus on sounds of water". Gaatha. Retrieved 3 February 2014. ^ a b "Shikara Ride". J & K Tourism. Retrieved 2 February 2014.